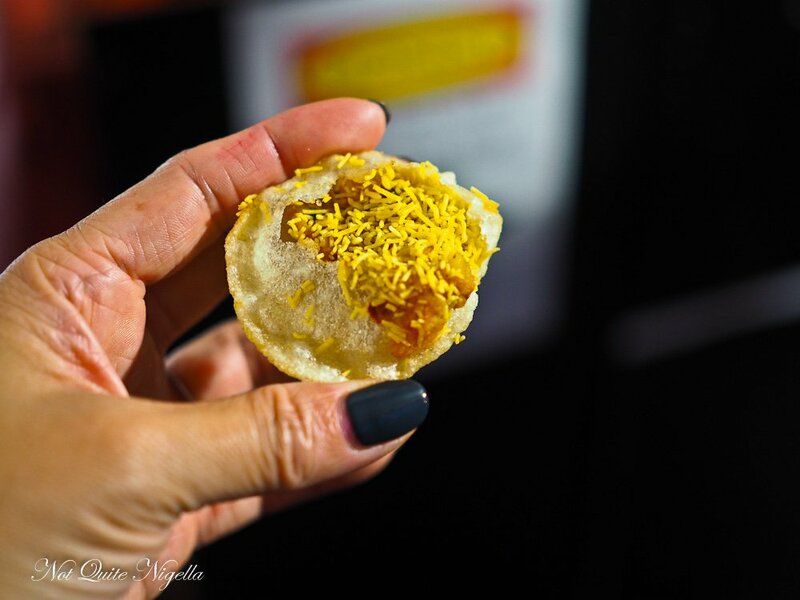 A Moveable Indian Feast at Harris Park! 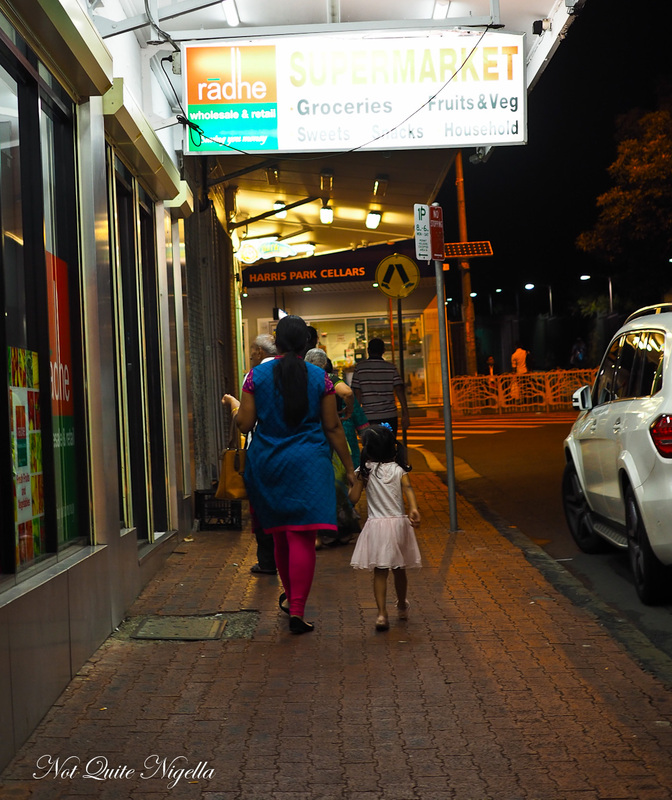 The suburb of Harris Park in Sydney's West is home to Little India, a neighbourhood where Indian businesses thrive and cater for their local clientele. 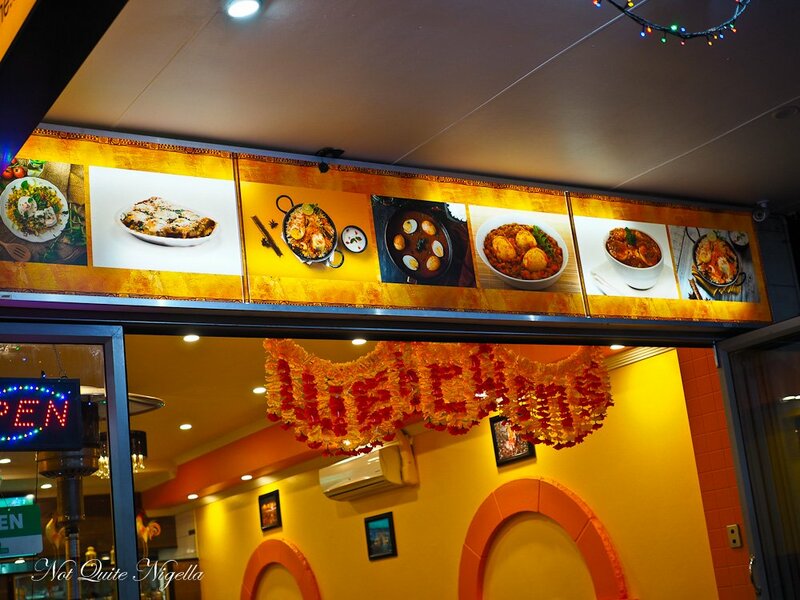 Restaurants are located in converted houses and serve up incredibly tasty Indian food at very reasonable prices. It is also the location where we decide to do a little movable feast! A few times a year my sometime vegetarian friend Laura and I catch up. It always involves an adventure usually to somewhere a bit further out because we both love travelling for food. "I feel like Indian food," said Laura, who is now a vegetarian that eats fish and chicken and she picked me up from my place in her cute little striped Mini car and it was off to Harris Park! "God it's a bit far away," she said looking at the GPS. "But it will be worth it," we both agreed at the same time. She had never been to Harris Park, the suburb right next to Parramatta but I have fond memories of walking down Wigram Road and eating from the fairy light strewn restaurants set up in houses. "We're almost there! There's the Hooters!" 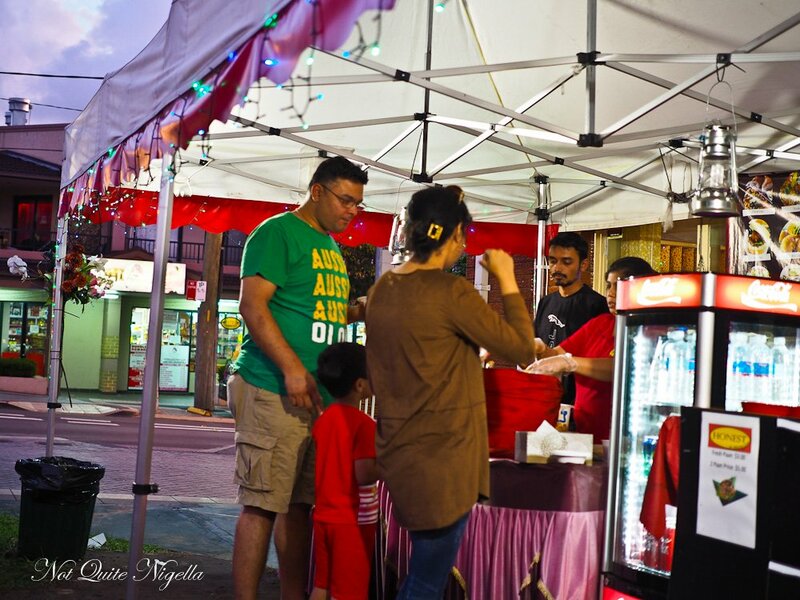 says Laura excitedly and then in the middle of what looks to be a very residential area is the famous Little India area of Harris Park. The main restaurants, shops and eateries span across a few streets that fan out from the train station. There is no reason to leave Harris Park-in one street there are two medical centres, an accountant, a jeweller and a dentist. We get a park and spot a restaurant called Honest. "We have to eat here!" we say to each other. 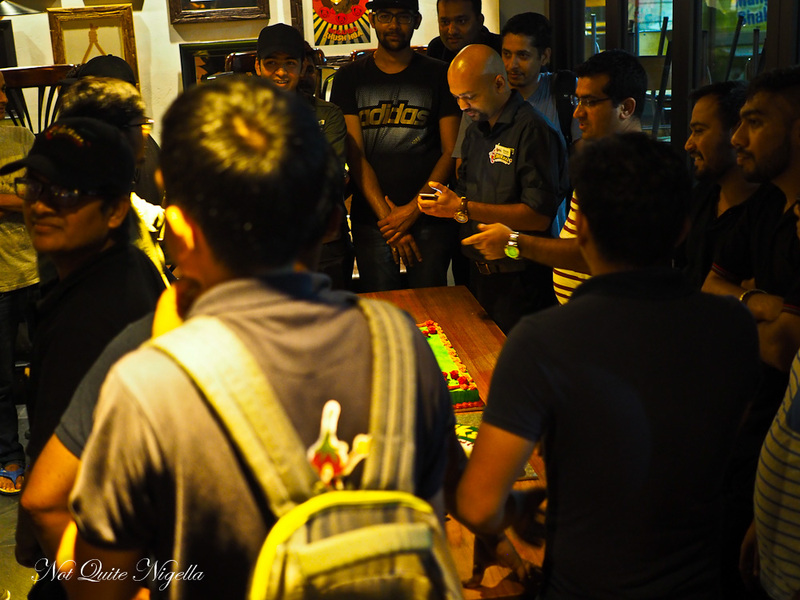 We had originally planned to go to one restaurant but seeing how many interesting places there were we decide to have a movable feast and try canapes, entrees, mains and desserts at different restaurants. Walking up to it, it looks like a regular restaurant but outside is where the action is. 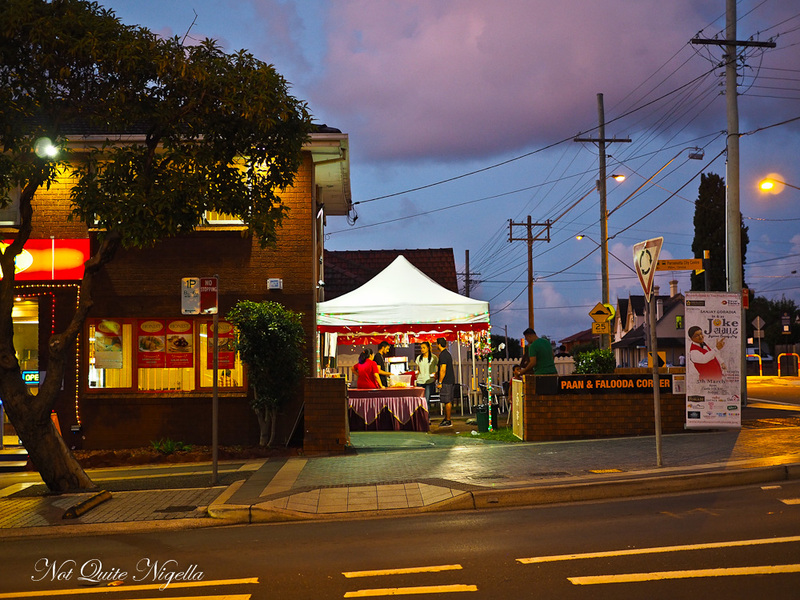 Like most of the restaurants in Harris Park, they're housed in converted houses and this house's garden is where they're selling pani poori, a delicious Indian street food snack. You take a bowl and they place a thin semi translucent shell made of flour. There are two buckets: a spicy salty liquid and a sweet one. They stuff some spiced potato in there and pour the liquid over. You have approximately 10 seconds to scoff the whole thing before the shell disintegrates. We take turn scoffing salty ones, sweet ones and then ones with both sweet and salty water. They're all delicious and it's hard to choose a favourite. The salty one has a nice chilli punch to it but the sweet one also appeals. When we have eaten our fill we ask for the bill, it's $15 for everything. They then hand us one. "Complimentary!" they say with a smile. 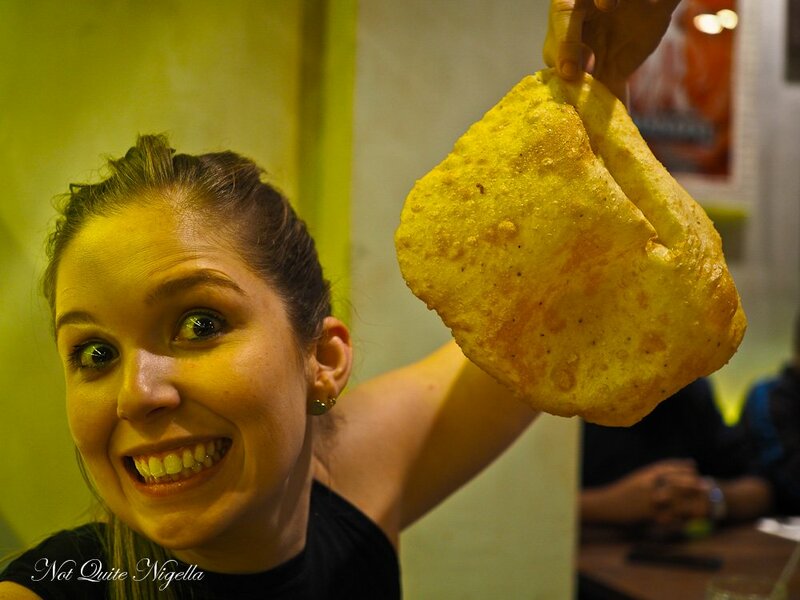 It's like the pani poori but without the liquid. You've got to love a grocery store that also does facials as well as mani pedis and we browse the aisles of a grocery store buying chips, drinks and biscuits and marvelling at the range of copper bowls. This is to snack on later. 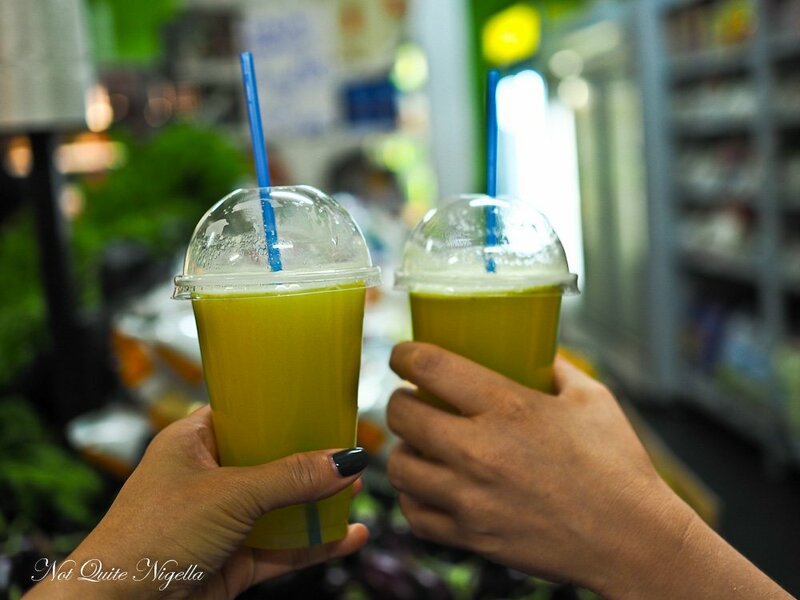 Then we stop at another grocery store where we order a freshly pressed sugar cane juice with ginger and mint to share. "I gave you two instead," says the friendly store owner handing us our juices. We have really been made to feel so welcome here. Eggzone isn't very busy this evening but we're intrigued by an egg based menu. "Is it ok if we share something?" 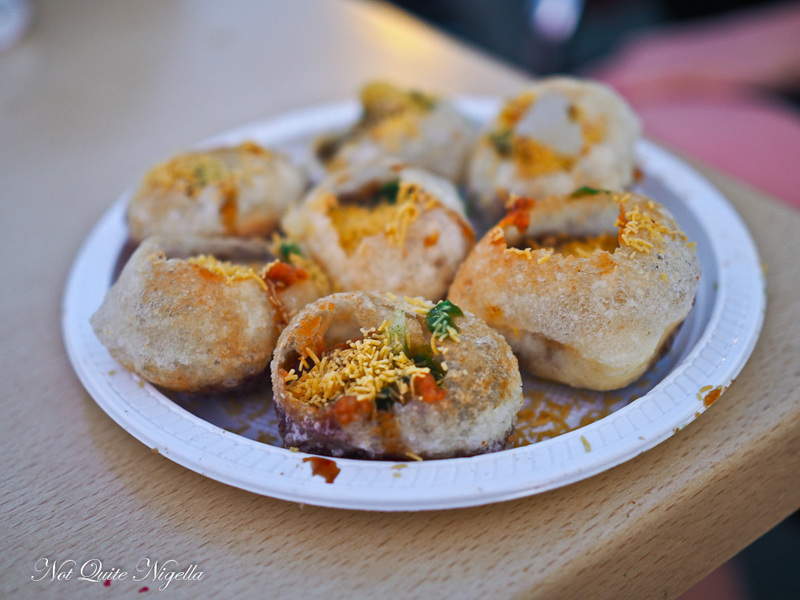 we ask as this is counting as our entree after our panipuri canapes. It's no problem. "What is your most popular dish?" we ask and they point us to the Chilli Boiled Eggs which we order along with a cheese and garlic naan. Holy heavens, this is a fantastic curry. 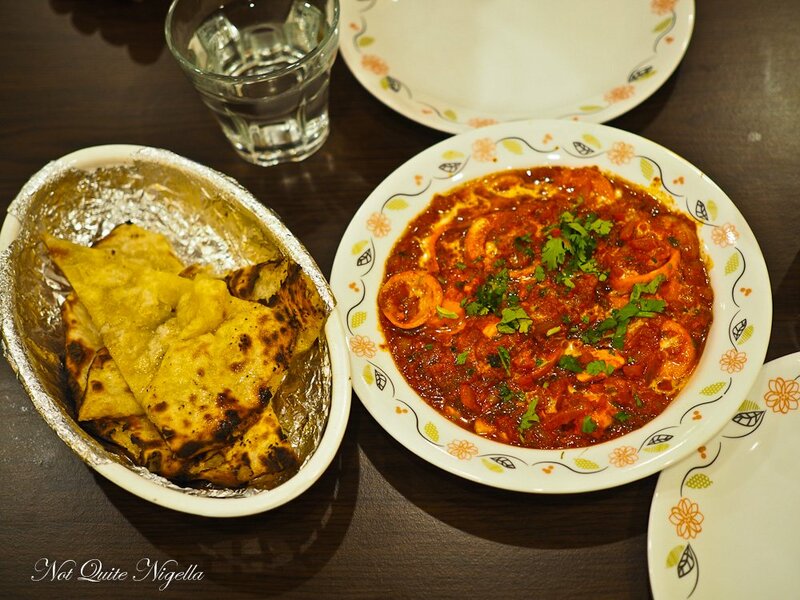 Richly flavoured with onions, tomato, garlic and chilli with sliced boiled eggs and masala spices this is so much more than a sum of its parts. It's fantastic and I want to remake this at home and serve it for breakfast on a slice of sourdough toast it's that good. "I don't want to stop eating this," I moan but I know that we have our mains next. We take it away not wanting it to go to waste. 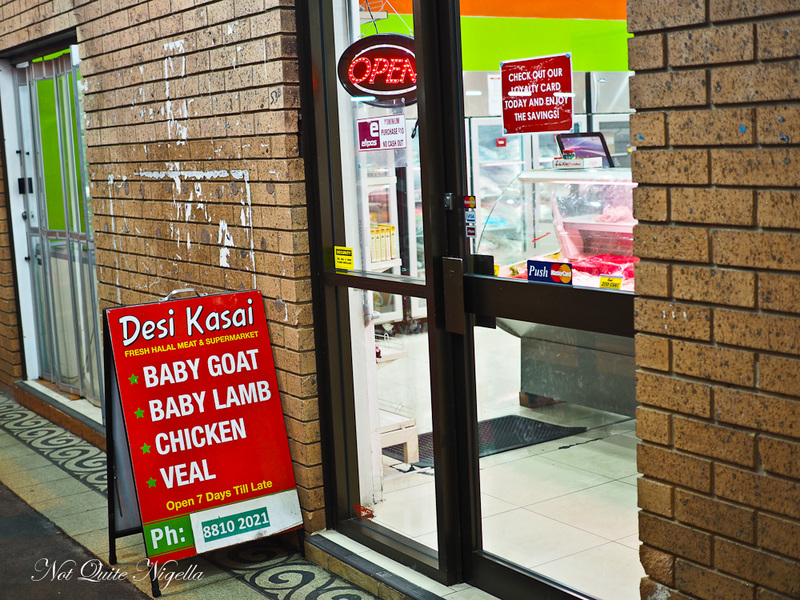 We pass a butcher shop-shops here are open til late catering for people that work. 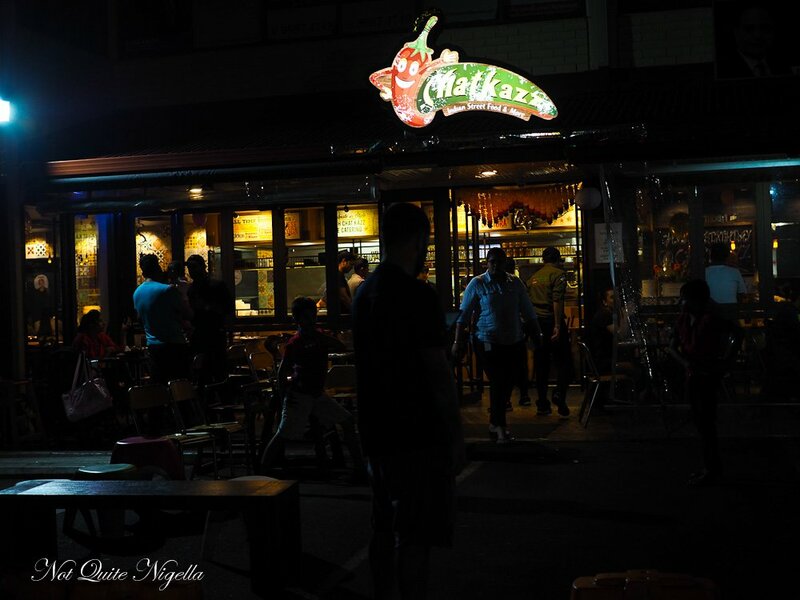 Our next stop is ChatKazz just opposite the station. They also have a sweet shop at the corner which we pop our head into that closes at 10pm so we make note of all of the colourful sweets and make plans to come back here after dinner for dessert. 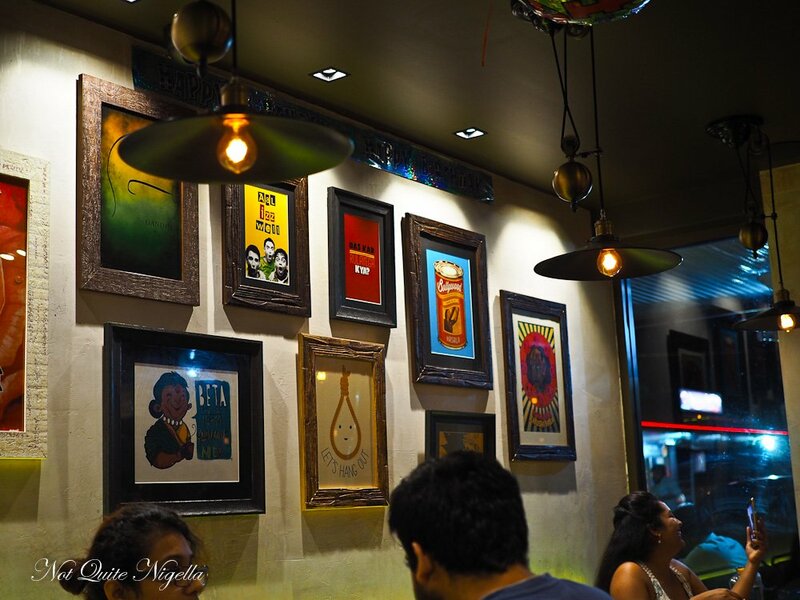 Chatkazz means spicy and delicious and this 100% vegetarian and hipstery designed restaurant is very busy with a pretty much entirely Indian customer base. Service is friendly and we are given a menu and a piece of paper to write down our choices. The menu however is huge and full of things that we are unfamiliar with so we ask for some assistance which they are happy to give us. We end up with three things. 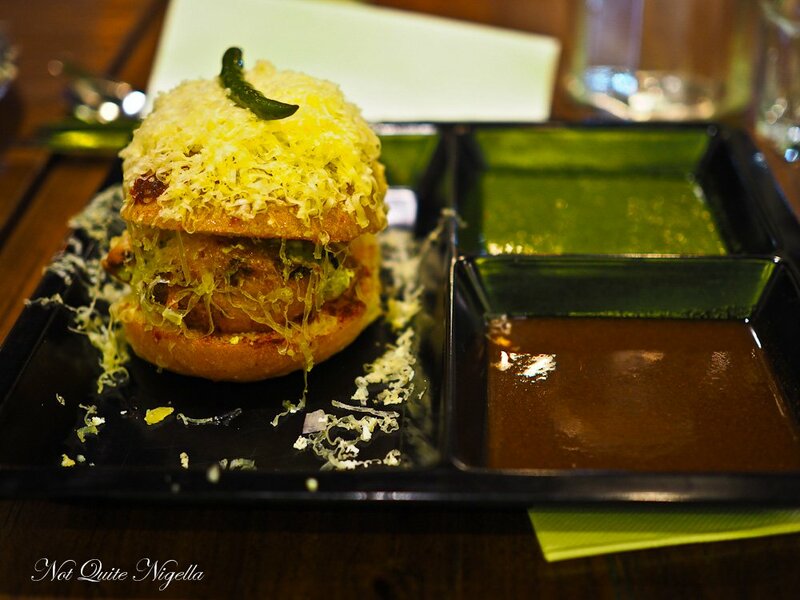 The first is a vada pav cheese butter masala, a potato cake in a bun and two dipping sauces. The sauces are sweet and herby and the potato cake is soft as is the bun and the whole thing is topped with grated cheese and makes for a filling snack. But the other two items are the real prizes. 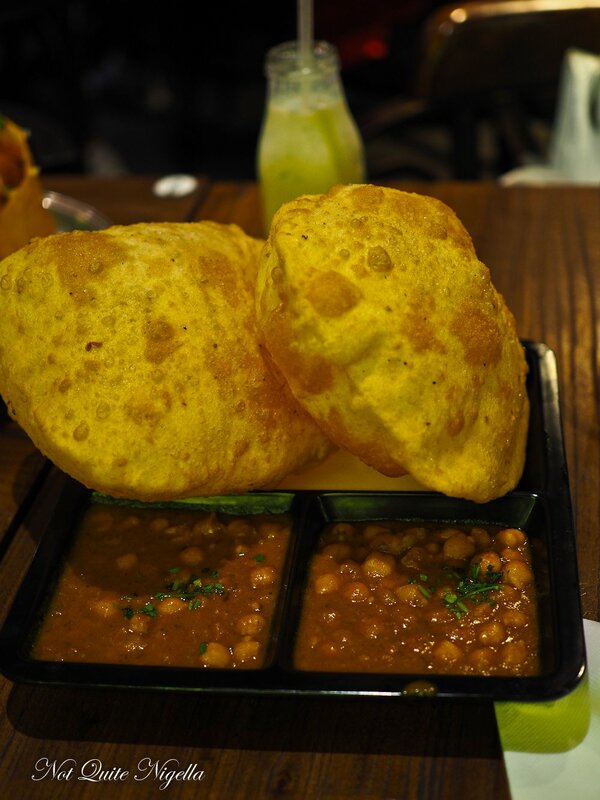 The chana masala or chickpea curry comes in a rich, creamy and spicy gravy with two enormous puffy bhatoora bread. We pull off pieces of the piping hot bhatoora, our fingers dancing with the heat and scoop up some of the creamy gravy and chickpeas. 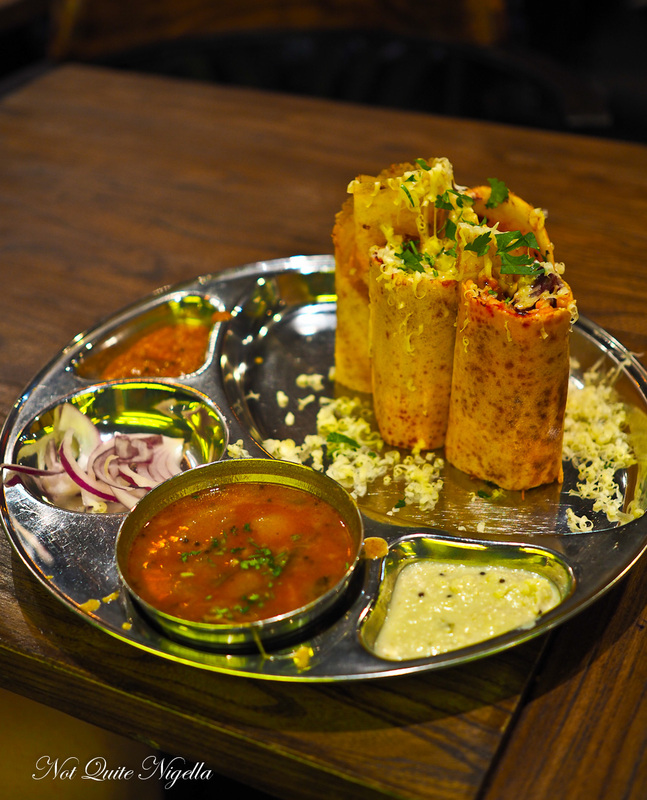 Then there's the Jini Dosa which is a dosa (thin crispy crepe) filled with shredded beetroot, cabbage, cheese and onions served standing up. 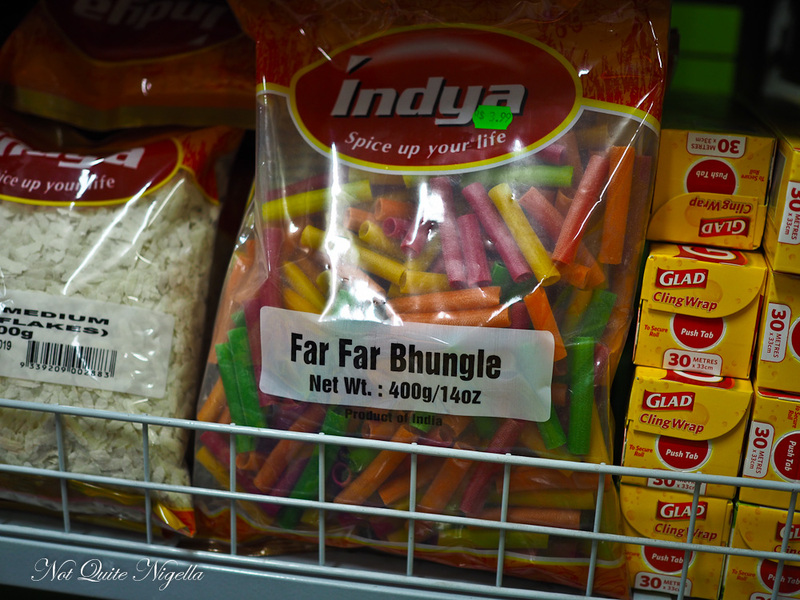 This is fantastic and I can really see why Indian food is known for its vegetarian offerings as I'd be totally happy with these and not even miss the meat. There are sauces and a soup on the side making this a complete meal. "Will you fill out this feedback form?" our waitress asks and we fill it out in great detail before leaving. We can't finish our meals but I know that Mr NQN will love them the next day when I am away. As we leave we notice the time. "OMG! It's 10:02pm," says Laura and sure enough the sweets shop is shut. It looks as though we may miss out on dessert. "Don't worry there's that other sweet shop," I remember but alas that too is shuttered up. "Let's do a drive around in the car and see what's open," suggests Laura which is a good idea so we bundle our purchases and takeaway into the car and drive around. All we see are closed signs. "Let's try the coconut cookies we bought," says Laura and we break the pneumatic packaging on them to reveal...stale cookies. They're downright awful. "We can't end our night on this!" says Laura determinedly and turns the car sharply around. "We're going back to Chatkazz!" she says driving into their tight carpark and then finding a park. Our waitresses look at us puzzled and we smile brightly, "We're back! Can we get some dessert takeaway?" we ask noting that the chairs are going up. The jelabi which I love so much are no longer available but we try a Golas and gulab jamun. The golas ice tower is very interesting-it comes in three flavour Kalakhatta (Cola), Orange and Kachi Keri which is like a menthol flavour. They recommend the first two. 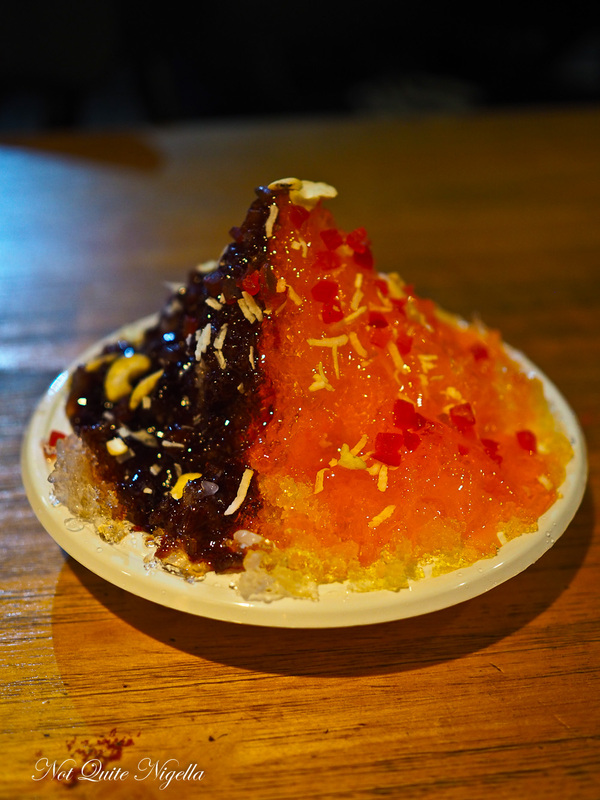 It has a thick, sticky glistening layer of syrup coating it and underneath is a shaved ice and syrup layer-it's deeply refreshing in this heat. 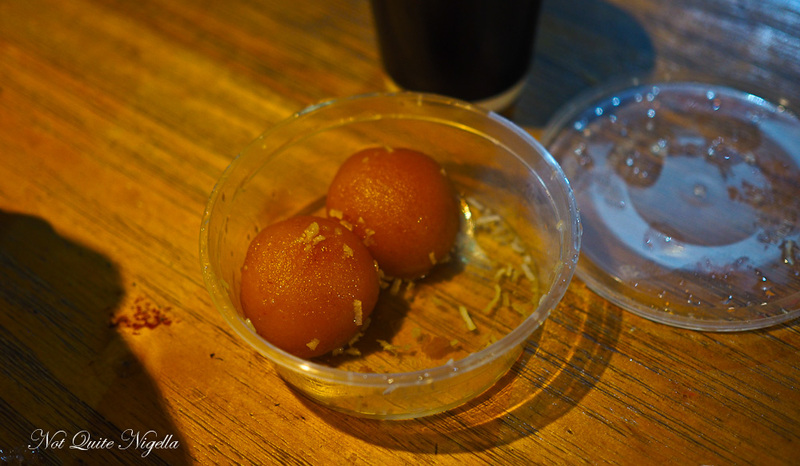 And the hot gulab jamun are divine-super soft and not as overly sweet as some I find them hard to resist. They show us the cakes that they are unboxing. It's the restaurant's fourth birthday and they have a chocolate cake and a vanilla and mango sheet cake. "Will you take a photo?" they ask and I happily oblige and promise to send the photos to them. "And in a few minutes you'll have a piece of cake!" they say. We think they're joking but they're not. 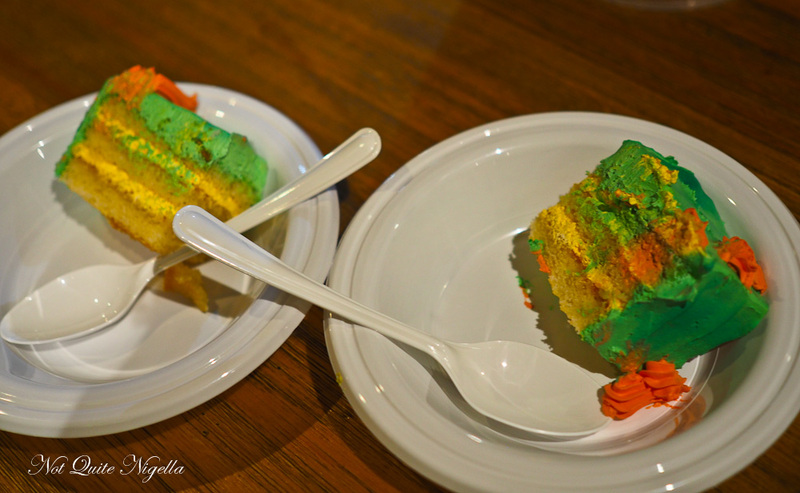 "Oh we're serious, please you're staying for cake," which is pretty much the most magical words you can hear ever. We stand back and take photos and snack on our ice tower. "Are you friends with the owners?" one man says. He lives in Randwick and travels here 3-4 times a week and has done so for 4 years. "No it's our first time here!" says Laura. "Actually our second, but our first visit was earlier tonight!" I add. So tell me Dear Reader, do you enjoy food adventures or do you prefer to stay at one restaurant? 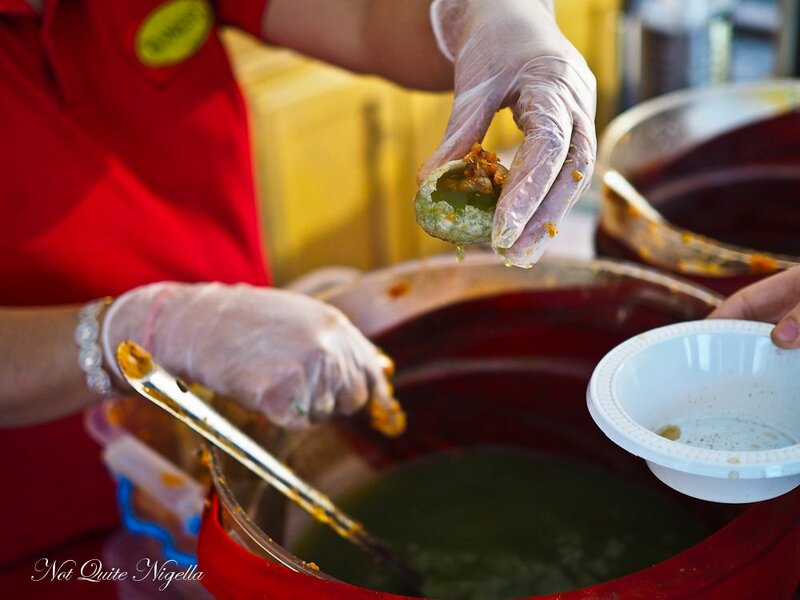 Have you ever made your own movable feast? And would you stay for cake?